Wolfgang Amadeus Mozart once proclaimed, "Bach is the father, we are the kids." His estimation may not seem surprising except that Mozart was referring not to Johann Sebastian Bach but to his second son, Carl Philipp Emanuel (1714-88). Proving to be the most accomplished of J. S. Bach’s children, C. P. E.'s popularity exceeded his father's among eighteenth-century composers. Much of the younger Bach's success can be attributed to his ability to write music that appealed to a variety of audiences. In particular, Bach claimed that his compositions were suitable for the Kenner and the Liebhaber (the connoisseur and the amateur). To satisfy his audience, Bach composed keyboard pieces that could be performed by less proficient musicians but were also interesting enough to please the aficionados. C. P. E. Bach's Sonata in F Major, H. 183 for keyboard (A Major in the present arrangement) was published as part of a collection of "Easy" (Leichte) sonatas in 1766. The relatively thin texture of the sonata poses few technical problems for amateur keyboardists, but the work is far from commonplace in its form and harmonic sophistication. 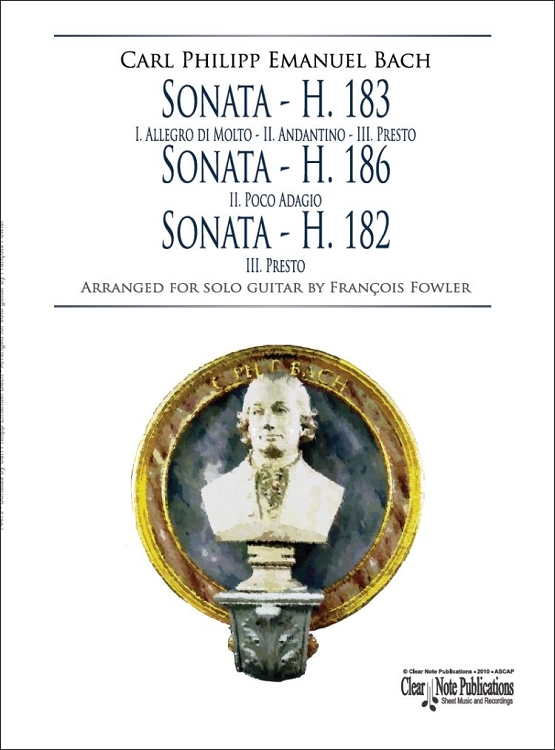 Unlike the other sonatas in the collection, which follow simpler two-part structures, the Sonata in F Major opens with a through-composed form more common to the first movement of concertos and symphonies than the solo keyboard repertoire. To conclude this already remarkable movement, in the final seven measures, Bach forsakes the cheerful F major tonality for F minor. This sudden shift is startling, but Bach uses it to prepare the listener for the second movement. The Andantino demonstrates Bach's mastery of the sensitive style (emfindsamer Stil). Expressive gestures abound in the middle movement as Bach employs dissonant harmonies, unexpected modulations, and affective chains of suspensions. The Andantino concludes, albeit hesitantly, on a C major triad, again anticipating the next movement. Eighteenth-century audiences desired variety in their music, and Bach offers more than enough for any taste in the Presto. Eschewing smooth transitions, the abrupt juxtaposition of several contrasting styles exposes an ironic tone in Bach's conclusion. This finale just does not sound conclusive, and the short phrases and frequent rests may lead one to believe that the composer himself did not know where or how the sonata would end. Certainly both the Kenner and the Liebhaber could appreciate some humor in their music. Two other transcriptions from keyboard sonatas present more characteristics of the younger Bach's genius. 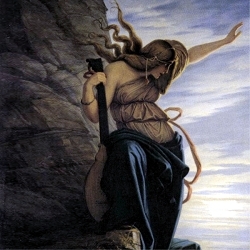 The Poco Adagio from the Sonata in A Major, H. 186 (G Major in the present arrangement) is also an example of the empfindsamer Stil. Although C.P.E. Bach's music is considered by many to be a bridge between the baroque and classical eras, a distinct, romantic longing is evident throughout the movement. The principal feature of the piece is a florid melody that showcases a catalog of expressive gestures and ornaments. The deceptive cadences, accented chromatic tones, and dynamic contrasts all add to the rhetorical flavor of the adagio movement. The stormy conclusion of Bach's Sonata in B Minor, H. 182 (A Minor in the present arrangement) is a more conventional finale than the Presto from the Sonata in F Major. 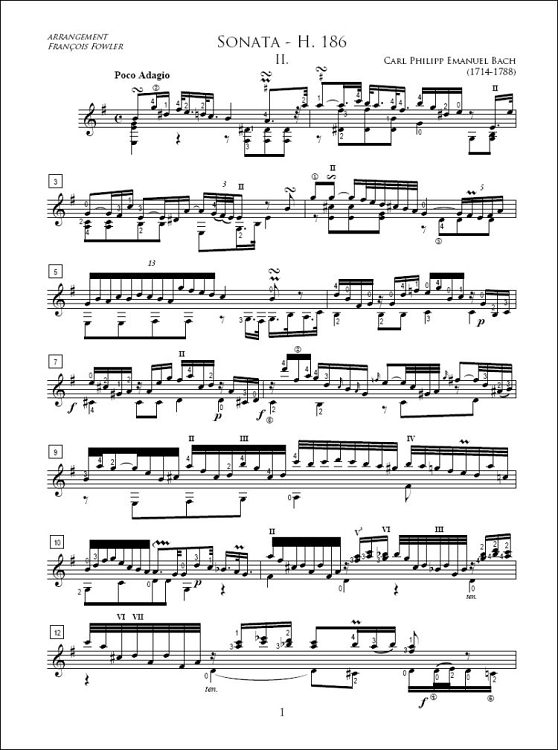 The persistent gigue rhythm propels the music through balanced periods and four-measure phrases. Overall, the style of the movement recalls the many gigue-finales of Bach's godfather Georg Philipp Telemann. An intentionally awkward measure of silence, however, is Bach's reminder that conventions are established to be broken.